If you want to build your own Beersbee or Polish Frisbee set, you’ll need a few things. I’ve put together a shopping list for you. DIY Beersbee really only comes with the PVC pipe. I recommend cutting one end of each pole at an angle. This will help you stick it in the ground more easily. Alternatively, purchase one 10 foot length of 2″ PC pipe and cut it at an angle in the middle. Try to keep your angle around 45 degrees. On the flat end of each length of pipe, attach one of the couplings. This will act as your base. That’s basically all you need. Stick the poles in the ground 35-40 feet apart from each other, place an empty beer bottle on top of each ( and crack open a cold one for yourself), and get to playing! Congrats on your do-it-yourself beersbee set! 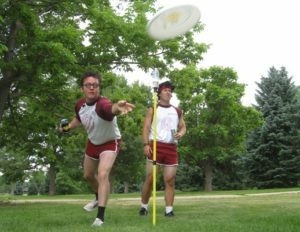 What is Beersbee?Beersbee, or Polish Horseshoes in some circles, is an up-and-coming yard game that involves a frisbee, a pole, and bottle (preferably glass, for the weight). Commonly a drinking game, many people find it best to require all players to play with only one hand… while keeping the other occupied with a beer. Beer bottles are placed on top of two poles, spread about 35 feet about from each other. Each team is defending one pole while attacking the other. The attacking team tosses a frisbee, attempting to hit their opponents pole or bottle and knock the bottle off. When contact is made, the defending team must attempt to catch the bottle before it falls to the ground. One point is awarded for hitting the pole, and another is awarded if the bottle hits the ground. That’s the gist and all you need to know to have fun. If you’re interested, check out the official Beersbee rules. The best place to buy Beersebee is on Amazon.com. This Lighted Deluxe Set comes with light-up poles and a light-up disc, so you can keep the game going well into the night. If you’re interested in something less flashy (and a bit more affordable), this Beersbee set from Triumph Sports is a great option. You can search around the internet for other options, but these are my best recommendations.